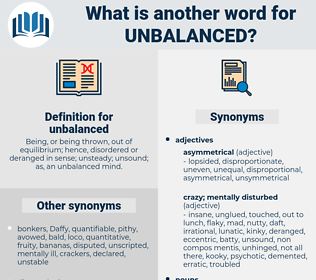 What is another word for unbalanced? Being, or being thrown, out of equilibrium; hence, disordered or deranged in sense; unsteady; unsound; as, an unbalanced mind. well-balanced, unstable, biased, disproportionate, unilateral, unmatched, partisan, prejudiced, even-handed, cross-over, well-rounded. unhinged, weighted, Waged, skewed, biased, prejudiced. uneven, unequal, one-sided, skewed, asymmetrical, tendentious, inequitable. just, stable, balanced, steady, smooth, level, even, sane, fair, well, sound. rational, stabilized, sensible, wise, well-adjusted, unneurotic, healthy, Equilibrated, reasonable, clear, substantial, straight, judicious, normal. Lady Wilmersley is said to be mentally unbalanced. These youthful and unbalanced reformers, in conjunction with older but no less ill - balanced provincial politicians, may be said to represent Young China.